I love house wares and all things connected to kitchen items and accessories as I’m fond of cooking, baking and making desserts. Lately I’ve noticed that I need to stock up on my bowls as my present ones are showing old age already. Since budget is of importance in buying my kitchen and dining accessories again I have to make sure that I’ll be buying wisely. 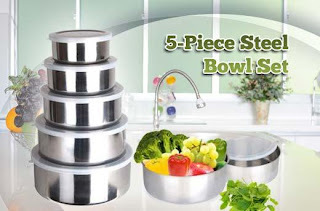 And how wise I can get with the deals I’ve found at Metro Deals offer like this 5-Piece Stainless Steel Bowl Storage Set with Plastic Lids which I can get for 52% off , price is PhP239 instead of PhP500 with free delivery. Now I can add my items in organizing and keeping fresh of my meals and foods. These 5 pcs stainless steel bowl measures 10cm, 12 cm, 14 cm, 16 cm and 18 cm. It’s perfect for gift giving also. I just love deals and discounts, how about you?